Soup is also a traditional part of the cuisine of each and every region of Italy. And specific soups are identified with specific regions. Two uniquely Tuscan soups are ribollita and pappa al pomodoro. Both are bread soups, and are essential to my Italian life. 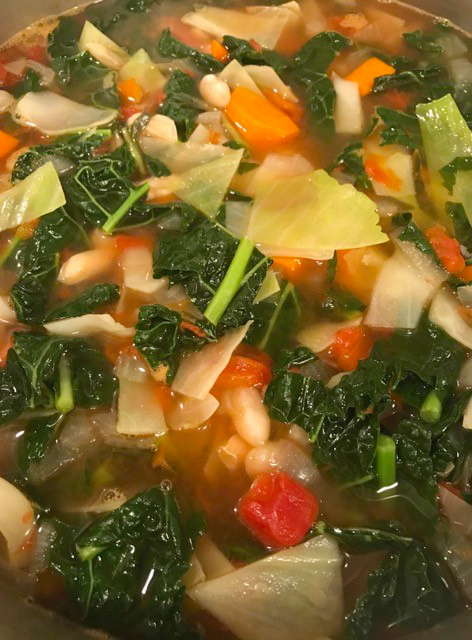 Ribollita, first and foremost, is a Tuscan minestrone, a mix of chopped vegetables simmered into a hearty, delicious blend. One of the main reasons I especially love minestrone, and prepare it frequently when I’m in Italy, is that you can usually buy a mix of ready-to-cook chopped veggies from most vegetable purveyors in the food markets, and even in some supermarkets. Sold by weight, the mix is inevitably typical of the area where you buy it. For example, in Rome there’s always cauliflower in the mix. And you can easily improvise and personalize your minestrone. I sometimes add beans or potatoes, broth in place of water, or canned or fresh tomatoes depending on what I have on hand. But only in Tuscany will you find ribollita, a minestrone that is cooked with bread. Heat the olive oil in a large pot (at least 5-quart) and add the onion, carrot and celery. Cook, stirring, until the onion begins to soften. Add the chard or kale, and the zucchini and continue cooking until the greens have begun to wilt. Add the beans and the tomatoes and 10 cups cold water to cover the vegetables. Place over medium high heat and bring to a boil. Lower the heat and simmer, covered, about 1 hour, stirring occasionally. Uncover and cook another half-hour. Use an immersion hand blender to partially puree the soup. Season with salt and pepper to taste. Add the bread and stir well to combine. Let the soup stand, at room temperature, overnight or for several hours. Place the pot on the stove over medium high heat and bring to a simmer. Lower the heat and continue cooking about a half-hour, stirring frequently to incorporate the bread into the soup. Serve the ribollita with a drizzle of olive oil on each serving.